In one of his wanderings through the fields near our home, Mr. 19 took this picture. Guess who is sharing our world. 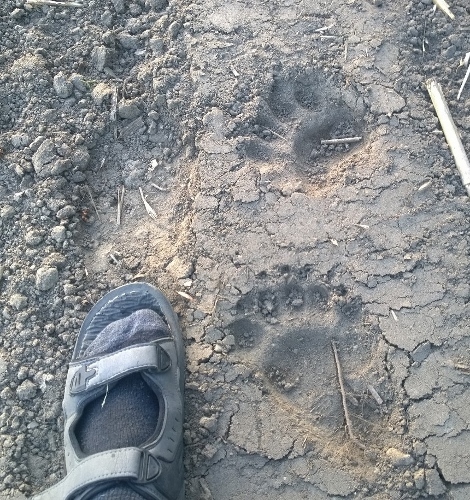 We knew that bears come around every year or two, but I had never seen any tracks before! Our children are used to running around freely outside and in the woods, but we have had to add a few bear safety rules. We would not want to do a close up nature study of a bear, that’s for sure! Posted in: God's Wonderful World, Life, Nature Study. Oh, I would find that very scary! Yes! But I have to control my fear and let at least my older ones go. The chances of trouble are much smaller than when letting them bike on the road…but this feels so much more frightening! Perhaps that is because it is so unusual. Oh dear! Do you know what kind they are? Are they interested in your chickens? They are black bears. I think they would be more interested in the bees than the chickens. A few years ago some beehives close by were torn open by a bear. However, bears are usually shy and ‘our’ beehives are quite close to our home. It’s the kids I’m really concerned about, when they venture into the bears’ territory. Wow, yes, follow the bear safety rules. Scary. Oh wow! Those are cute tracks though, but I’m sure seeing the bear up close would not be as much cute as it would be scary. Good job teaching your little ones bear safety.